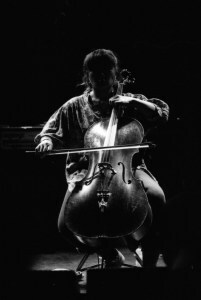 Okkyung Lee, a New York-based artist and South Korea native, has created a body of work blurring genre boundaries through collaborations and compositions while testing the limit of contemporary cello performance techniques. Her music draws inspirations from noise and extended techniques, jazz, Western classical, and Korean traditional and popular music. As a composer, her recent works include Cheol-Kkot-Sae (Steel Flower Bird) for 2 traditional Korean musicians and 5 improvisers, commissioned by SWR2 in Germany for Donaueschingen Music Festival in 2016, and still hoping for a miracle…? commissioned by Borealis Festival in Bergen, Norway in 2017. Okkyung was recipient of Doris Duke Performing Artist Award in 2015 and Foundation For Contemporary Arts Grant in 2010. New York-based flutist Gina Izzo and pianist Erika Dohi “…rattle speakers and expectations with stop-time razzle, vocal (flute-talk) and electronic (phaser) effects,” (NYC Jazz Record). Their music incorporates complex meters and non-conventional forms, while integrating improvisation and sophisticated post-production techniques. In 2015, RighteousGIRLS released their debut album gathering blue, collaborating with steel-pannist Andy Akiho, trumpeter Ambrose Akinmusire, and drummer Justin Brown in works by Ambrose Akinmusire, Andy Akiho, Pascal Le Boeuf, Christian Carey, Vijay Iyer, Dave Molk, Mike Perdue, Jonathan Ragonese, Randy Woolf. “The whole of gathering blue, featuring compositions by Vijay Iyer, Ambrose Akinmusire, and others, displays the same enthralling quick-change artistry.” (Brooklyn Rail). RighteousGIRLS have performed at venues including Lincoln Center, Joe’s Pub at the Public Theater, Rockwood Music Hall, the Atlas Performing Arts Center, and at SubCulture alongside Steve Coleman & the Five Elements, Rudresh Mahanthappa and the Prism Quartet, and Wet Ink Ensemble. The duo has received a 2016 IMPACT Award, a 2015 New Music USA Project Grant, a 2014 Independent Music Awards Nomination for gathering blue (Best Album) and KARakurENAI (Best Instrumental) by composer/steel-pannist Andy Akiho, “Best Album of the Year” in Downbeat Magazine (2015), and have been featured on Q2 Music, WQXR, and WNYC. Virtuosic, adventurous, and charismatic, RighteousGIRLS play with white-hot intensity and cool control.